Participants at the women’s economic empowerment scoping study workshop – Minister Baklai Temengil Chilton (centre), Dr Unaisi Nabobo-Baba (second from left), Jodean Remengesau (right), Olympia Morei, (left) and Julita Tellei (second from right). Photo Credit: Maire Dwyer, The Pacific Community. Whilst Palauan women are active in the economy, own many businesses, and have high labour force participation by Pacific and world standards at almost 75 per cent, they also face many challenges. Women are less likely to be employers than men and they account for only one third of all self-employed people in Palau. 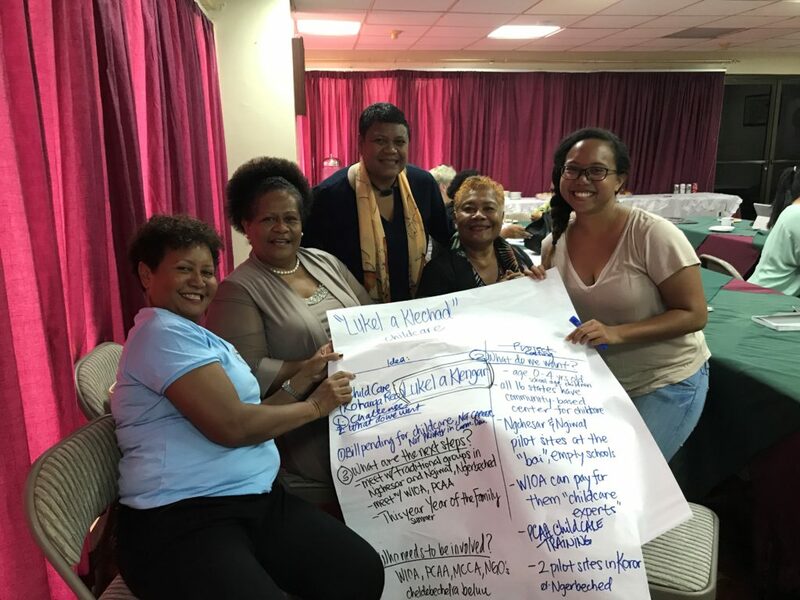 Stakeholders agreed on three priority areas to support women’s economic empowerment in Palau: support for women in business, increased availability of childcare services and mandatory paid parental leave in the private sector. To support women in business, stakeholders discussed holding a Women in Business Summit to focus on the specific needs of women entrepreneurs. To reduce women’s unpaid workload and support women’s economic opportunities, stakeholders championed regulated childcare and afterschool services. The lukel a klechad childcare model that emphasises Palauan community values, philosophy, language, history, and cultural heritage was discussed. Ms Ngiraidis also drew on her personal experiences to contribute to the study’s understanding of women, family, and work dynamics in Palau.